Haus Schaeben is a medium-sized German family business based in Frechen near Cologne. The company can look back on a long tradition that goes back to historical roots dating back to the 16th century, when it was still a “distillery” near Cologne Cathedral. The last three generations were members of the Hünemeyer family and for the last 20 years Heiko Hünemeyer is managing the company. A team of 50 employees supports his efforts and contributes to the success of the company through team spirit and commitment. Product innovation is one of the pillars of the company. This includes not only the marketing team, but all employees whose ideas and visions are decisive components of the company’s performance. While the name Schaebens has been a synonym for traditional, proven medicines and care products such as melissa tonic or rubbing alcohol for many decades, Schaebens has since established itself as a supplier of high-quality body care/cosmetics products which are characterised by excellent compatibility with all skin types and optimum effectiveness. While products such as masks and concentrated beauty treatments are dedicated to intensive facial care and above all wellness and relaxation, the company has also been selling a body care line containing minerals from the Dead Sea for many years. The popular Schaebens Dead Sea Salt Line is a medical base care line for problem skin that has proven itself in tests especially for skin diseases such as neurodermatitis and psoriasis. 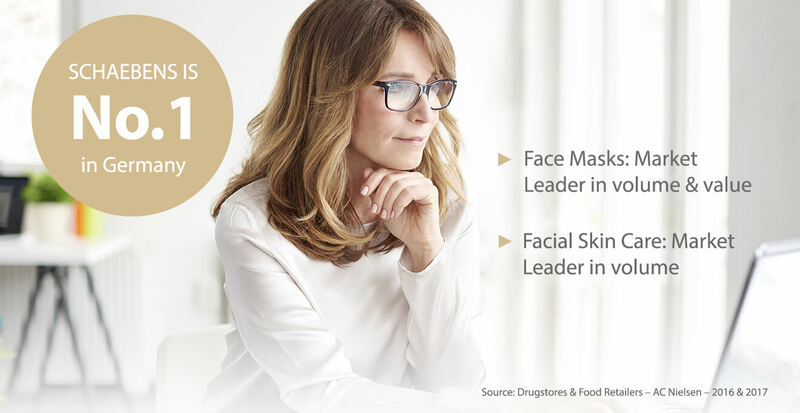 Our demands on the quality of our products are very high: Before a product comes onto the market, its formula is tested by “Dermatest”, an independent dermatological institution, for its effectiveness and skin compatibility. All our cosmetic products have been awarded the “very good” rating in dermatology and the 5-star guarantee of the independent dermatological institute Dermatest. This 5-star guarantee is the highest quality standard that can be awarded by Dermatest. It is awarded after long-term application tests and gives the greatest possible assurance that no incompatibility reactions will occur among future buyers and users of the tested product. 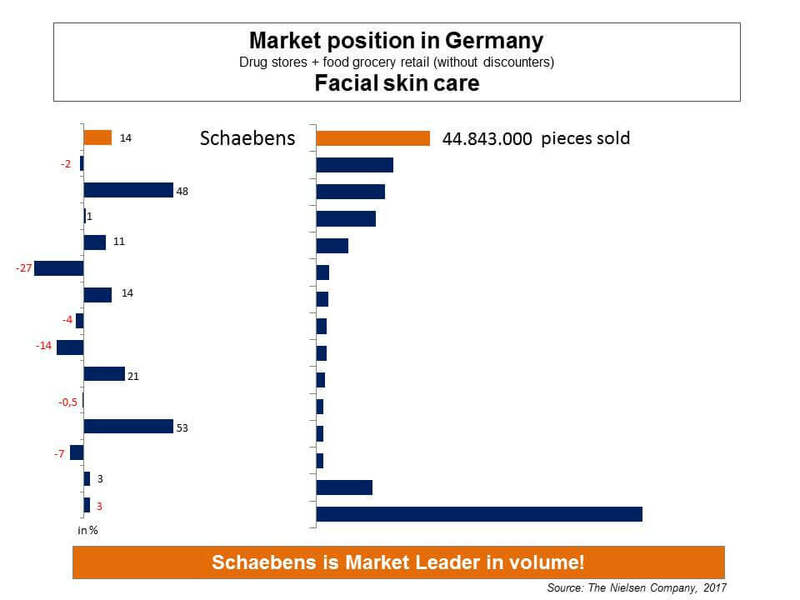 Schaebens is one of the leading suppliers in Germany in the field of cosmetics and pharmaceuticals/health. With our brand we react to the wishes and requirements of the consumers and are always anxious to be ahead of the time. 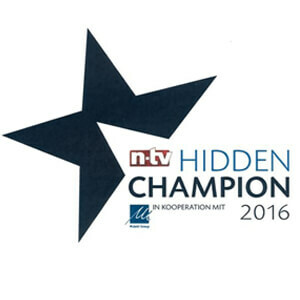 Several years ago, the continuous improvement and development of new products secured our position as market leader in facial care (after Nielsen in terms of units sold), the second most important segment of the cosmetics industry, with the Nielsen market research institute conducting consumer studies in 47 European markets and in over 100 countries worldwide. 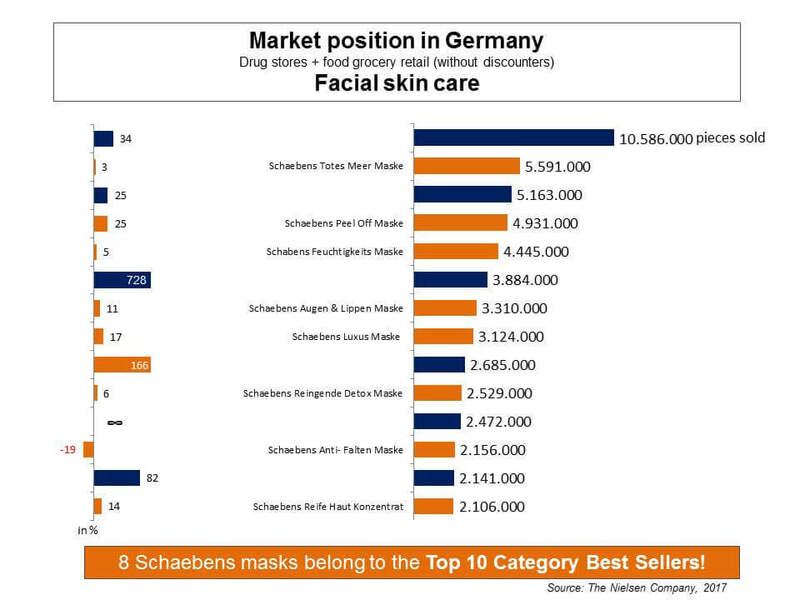 According to the Institute’s Catcom study, Schaebens has been the most successful market leader with the highest relative and absolute sales growth* among the 21 market leaders in the German cosmetics industry since 2015. 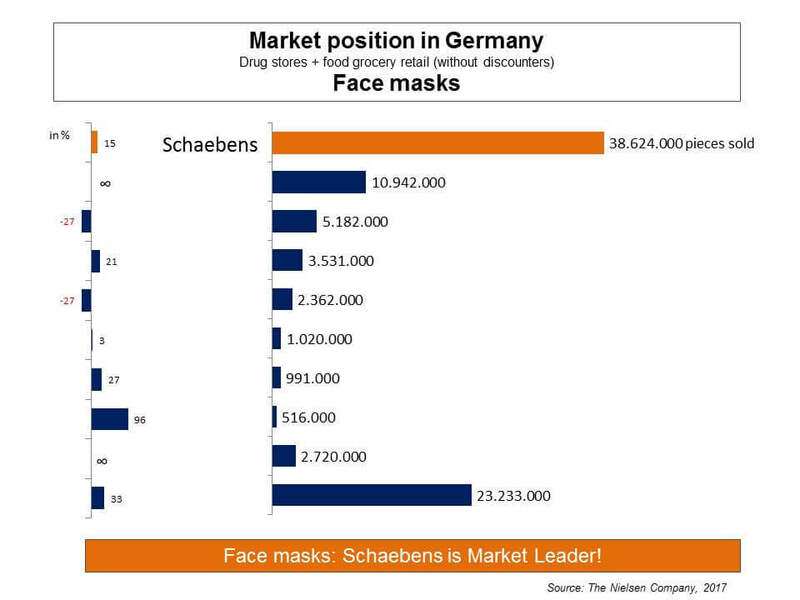 Schaebens is not only still successful in Germany, but is also opening up international markets. Constant dialogue with our customers and especially with our end consumers has top priority for us. We attach great importance to personal contact and we highly value qualitative advice, because your skin should receive the best possible care. True to the motto: “Maximum effect with minimum side effects”. Without the commitment of our employees, our family business would not be where it is today. The loyalty of our employees, their motivation and qualifications are the driving force behind our company. In everything we do, we attach great value to the continuing education and training of our employees in order to cope with the continuous change in our fast-moving times. It is particularly important to us that our employees recognise and develop their individual potential in addition to the general training and further education measures available. We have our finances firmly under control and attach great importance to independence. As a result, we avoid external service providers and pursue a sustainable company financial policy. The cosmetics industry is characterized by dynamism, which means being permanently flexible and innovative. Trendsetting through a well-conceived company suggestion scheme is our basis for consumer-oriented product development. 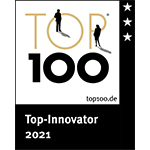 It is not without reason that we are one of the most innovative companies in Germany, for which we have already received several awards. As a family business steeped in tradition, we attach great importance to the compatibility of work and family life. We are pleased to have the employee not only as a worker, but also as a person in the team. Anniversary celebrations and employee events, at which we also like to celebrate together with the family members of our colleagues, are just as much a tradition as the connection to our location. We see it as our duty to maintain our culture and recall the company history. Cooperation with our trading partners, but also with clubs and associations, is very important to us. We see it as our responsibility to act fairly at all times and to deal on an economic, social and cultural base. Our goals are to guarantee a safe workplace for our employees and to create new jobs, and this always within the bounds of economic and ecological possibilities. Sustained sales growth and the expansion of the Schaebens brand is our primary goal, which we are pursuing in Germany and internationally. Healthy growth with social responsibility. Nothing is more important than acting sustainably. However, this cannot be reduced to an economic interest. Sustainability is a holistic factor. Social and ecological aspects must be taken into account in everything we do and achieve. As a result, we see economy, ecology and social issues as three equal components that must be reconciled in our daily work. As a traditional family-owned company, we are able to respond to the individual needs of employees and customers alike. Short decision-making and communication paths are our distinguishing feature and offer many advantages. Acting fairly in our dealings with all our partners leads to long-term and successful cooperation. We measure our actions by how we would like to be treated ourselves and therefore maintain open and honest communication with employees, customers and service providers.